Staying in this wonderful apartment is a privilege because, in addition to quality and a great location with a private terrace to enjoy wonderful views. 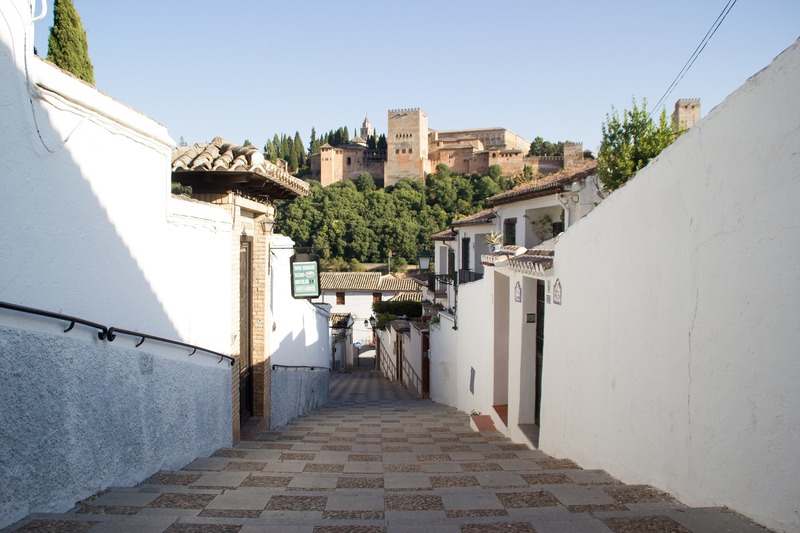 Therefore, it is a perfect option to enjoy unforgettable days in the beautiful city of Granada. With up to four people, the apartment is in a building cataloged XVI-XVII century and intervened on its facade in later centuries. Currently rehabilitated with traditional building materials offers a superior quality. The Albaicín is one of the most representative areas of Granada. Through the walk of its narrow streets, you can get lost in that charming sinuous maze and discover the traditional cármenes, that is to say, isolated houses surrounded by a high wall and that have a small garden. This neighbourhood is situated at 700-800 metres above sea level; it extends from the highest area (San Nicolás) to the Darro river and the calle Elvira, which meet at Plaza Nueva. It was court of the Zirid dynasty in the 11th century and it is considered as the last Muslim stronghold before being expelled of Granada. Its heyday was in the past few years of the Nasrid power, with a population of over forty thousand inhabitants and thirty mosques. The Albaicín mixes the medieval constructions with the traditional Mediterranean architecture, giving rise to a harmonious combination of different styles. It exhibits a lot of examples of its Moorish origin and of its Muslim spirit, because there are remains of the medieval wall, of the different access, such as the Puerta de Elvira (Gate of Elvira) or the Puerta de Fajalauza (Gate of Fajalauza). Besides, there are minarets, mosques, some Almohad mansion or even Hispanic-Muslim cisterns that distributed the drinking water. For this reason, its streets full of history and art allow you to take you back to another period in history. The miradores de San Nicolás y de San Cristóbal make it possible to enjoy the beautiful views not only of Granada, but also of the Alhambra. Besides, some interesting tourist places are El Bañuelo (wonderful public baths), the illuminated and intimate squares, such as the Plaza de Porras, Plaza de las Azucenas and Plaza de San Miguel Bajo, or some flamenco venues (tablao flamenco in Spanish) for enjoying the unique pure art in the cradle of the flamenco. Thus, this area gets that the person who walks on it notice the essence of the past time in the present itself, while admiring this architectural contrast and having a good time in a flamenco spectacle that cannot fail to move you. Not surprisingly, it was declared a UNESCO World Heritage Site, like the Alhambra and the Generalife.